Your horse still trundles along, heavy footed and maybe also heavy in your hand. Or, your horse is constantly in danger of putting you on the fast track to front tooth implants, with his head always in your face. Perhaps your horse travels in a decent frame, but steering or transitions are problems. It can be such a challenge to get your horse to cooperate! You’re trying your best, but nothing is working. What is the secret to improving these situations? The solution likely lies within you. Equitation is boring. When I was learning to ride, it was always the class where the girls who could pose well would win, but they couldn’t actually handle themselves in a stiff jump-off. That situation hasn’t changed much today – whether Western or English style of riding, it’s about the looks and not much else. However, showring corruption aside, equitation is at the core of all good riding. It is about both form and function, and without it you will find yourself struggling with all of the above challenges and more. 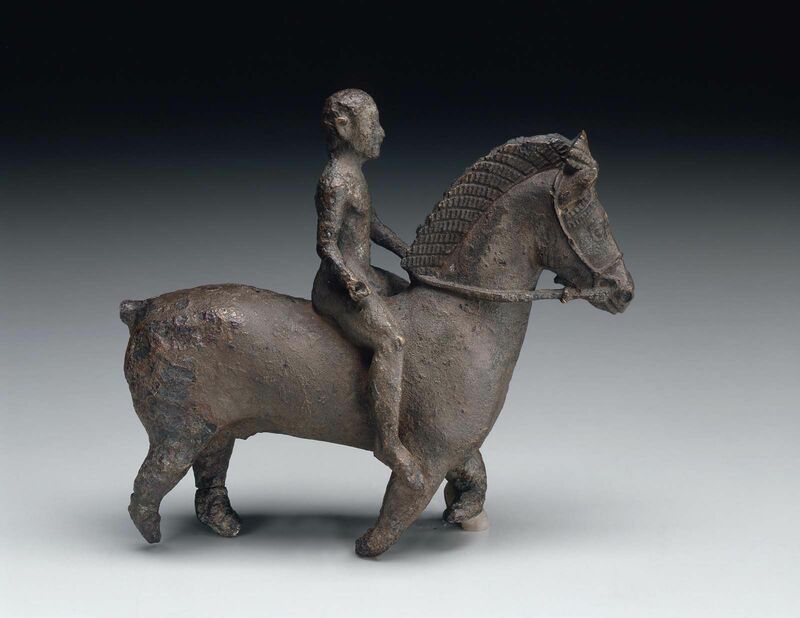 This sculpture from 525 BC exemplifies a balance seat. The primary function of good equitation is to create a balanced rider. 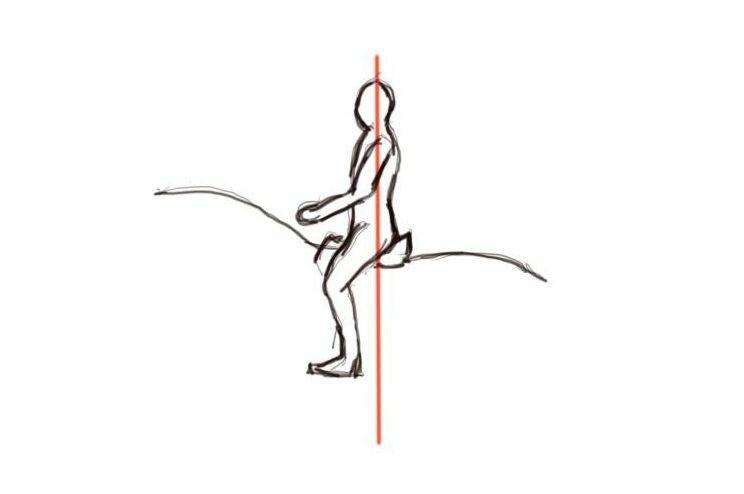 The form that has been developed by multiple cultures, across many centuries, provides the best possible balance for a biped mounted atop a quadruped. This, of course, provides you with the most comfort as you sit atop a moving animal – but it has an even more important function. In a recent Facebook post, someone praised schoolmasters for their patience with beginning riders. The catalyst for the praise? That person had spent some time giving a young child rides on their shoulders, and learned just how hard it is to balance a rider who does not balance themselves. It is all too easy to assume that a horse, standing horizontal and weighing up to ten times what you do, would have little problem with your slight balance issues – but the truth is far from that. Sit on a baby horse, who has never been backed, and try leaning a bit to the side. You will generally get one of two reactions – they will begin to topple in that direction, moving in an attempt to regain their balance; or, they will take one big step in the direction you lean and stop splay footed, refusing to move further. Even mature, schooled horses are very sensitive to the balance of the rider above. For a while I used Ben to teach riding to a girl with cerebral palsy. This young girl weighed no more than fifty pounds, and Ben was a solid 16.1 horse – yet, for every imbalance from her he made a slight shift to stay underneath her. Compare this photo of Richard Waetjen to the sculpture above – a balanced seat is timeless. Those may be extreme examples, but the principle remains the same – for every moment of imbalance in your position, the horse is having to readjust his. Depending upon the burden you are (which includes height/length, as well as weight), that may not be a big issue if you are out hacking. But, if you are asking a horse to jump a fence, particularly on rugged terrain, or asking him for the lightness of classical Dressage, each of those little adjustments he has to make takes away from the job you are asking of him. Have you ever had a favorite song come on the radio, just as you drive out of range of the station? You strain to hear the song through static and conflicting voices as other stations come in range. You want to hear that song, but there’s just too much noise in the way – so you shut the station off. Imagine if this becomes a daily occurrence. Eventually you don’t even bother to listen to the station, knowing that it’s going to get jumbled up with static. It is hard to imagine that this rider is not creating a lot of noise with this position. Taken from a still of a video, I can attest to there being a wiggly middle, banging legs, and overactive hands – all of which show in the posture. This is the daily experience for many horses – many riders have so much going on that the horse cannot pick out the important messages from the background noise and static. Whether it’s busy hands, a wiggly abdomen, or continually banging legs – everything you do is sending a signal to the horse. It is up to you to make sure that those signals are meaningful. If there is no purpose or meaning, the horse will eventually tune them out. Since our aids involve our hands, seat, and legs, that last thing we actually want is for the horse to tune those out! I will never forget some advice that was given in one of the training conferences I’ve attended – if you want to get their attention, whisper! The speaker meant this literally, as the conference was for workplace trainers. The power of the whisper is that the listener has to tune in to hear it – and they stay tuned in, waiting for the next words. The principle holds when riding your horse – if you can sit in silence, then you can whisper and you will be heard. And when the horse learns to anticipate a whisper, he listens more carefully for the next one. 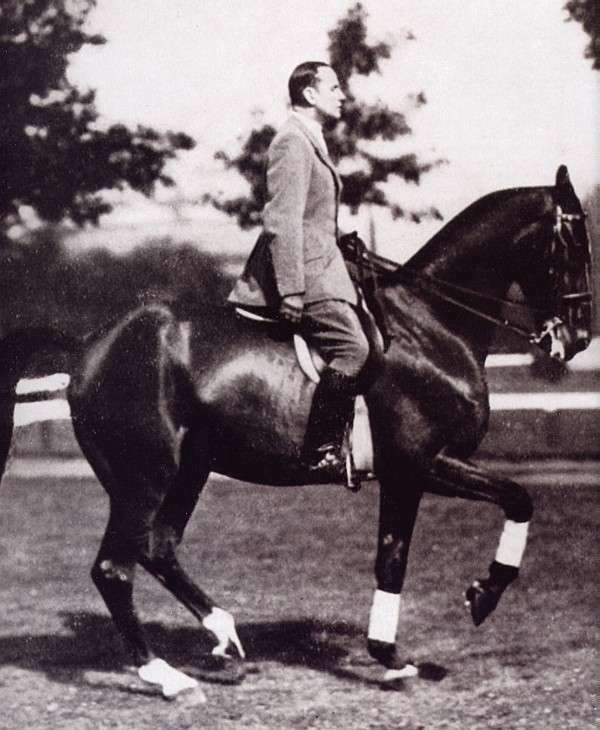 The arched back, open elbow, and forward leg braced against the stirrup are signs this rider lacks elasticity, and is likely not able to sit quietly. My mentor would frequently say that a correct seat is about “sitting quietly, but not sitting still.” That can be a confusing concept, but the answer comes down to a balance between appropriate tension and elasticity. The tension comes in with keeping those parts quiet that I discussed above – for example, a certain amount of tension (or engagement, if you prefer) in abdominal muscles is required to prevent the wobbling and wiggling so frequently seen. But, in order to prevent yourself from banging up and down on the horse’s back, it takes elasticity in the hips, knees, and ankles. Each rider has their own struggle in this realm. My mother is a naturally tense person, when it comes to movement. This made it very easy for her trunk to operate correctly early on. However, that tension has been a challenge with her joints, making sitting a challenge. I have taught riders with the opposite problem – so much looseness that the seat stayed beautifully with the horse, but the middle, legs, and arms flapped about. Identifying your own specific challenges is critical to being able to improve. Some jumper riders can make this work, but imagine how landing will be for both horse and rider! In the end, the key to all of the above lies in posture. This can be a surprisingly controversial topic. You can point to many successful riders, over time, who do not adhere to a classically correct position. I would argue that those riders possess talent beyond the average – whether accrued through experience, or just superior athletic ability. I have watched highly successful jumper riders with positions that would leave most of us in the dirt. I have heard that Nuno was very dissatisfied with his own position as he got older. But these are the exceptions that actually prove the rule. 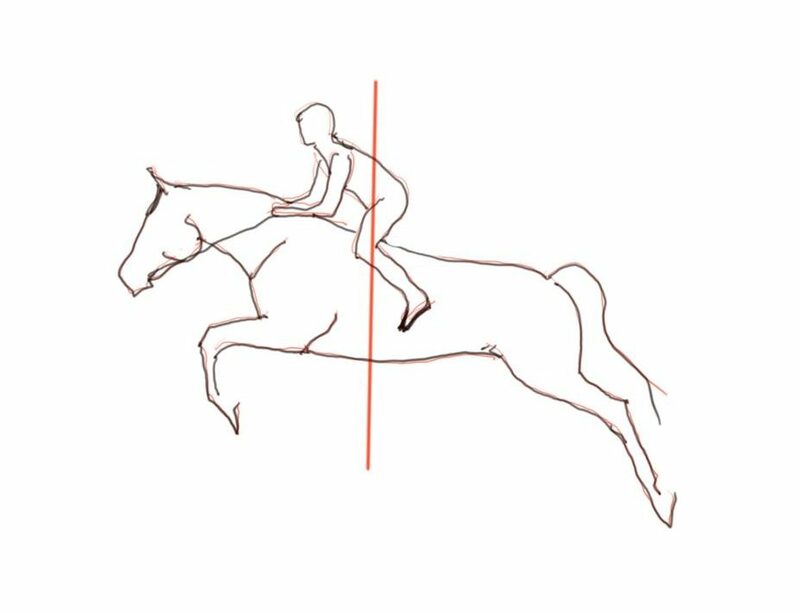 A nicely balance position that causes little burden for the horse – and would remain stable if placed on solid ground in the same position. 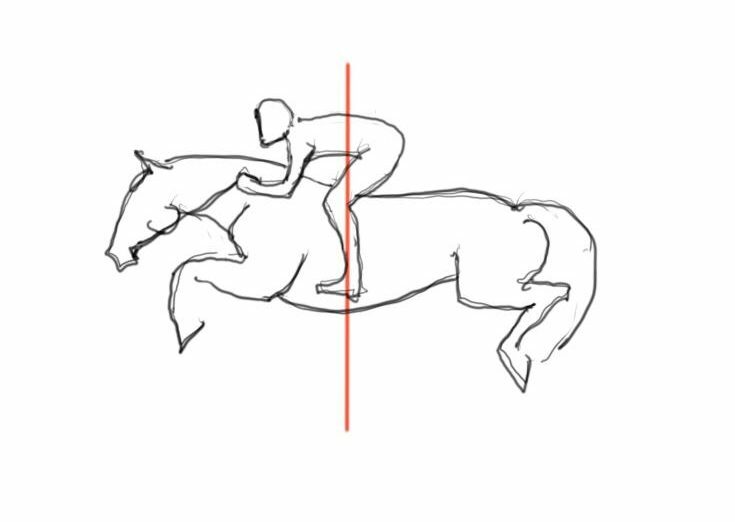 I will write a later post covering the specifics of position, but I will leave you with this standard that I was taught by Dressage and jumping trainers – if you take the horse out of the picture, would the rider still be able to maintain that position on flat ground? This goes back to the point about balance – whatever your position preference, you should be able to maintain it on flat ground, without undue strain or losing your balance. If you are maintaining your own balance, then you are upholding your end of the bargain, and giving your horse more freedom to do the job you are asking of him. We’ve probably all seen it – that skilled horseman who jumps on someone’s horse and the transformation seems almost magical. The horse is suddenly round, soft, balanced, and elastic. Movements that always seemed a struggle somehow become easy; or the jump that was always flat and jarring suddenly becomes round and soft. 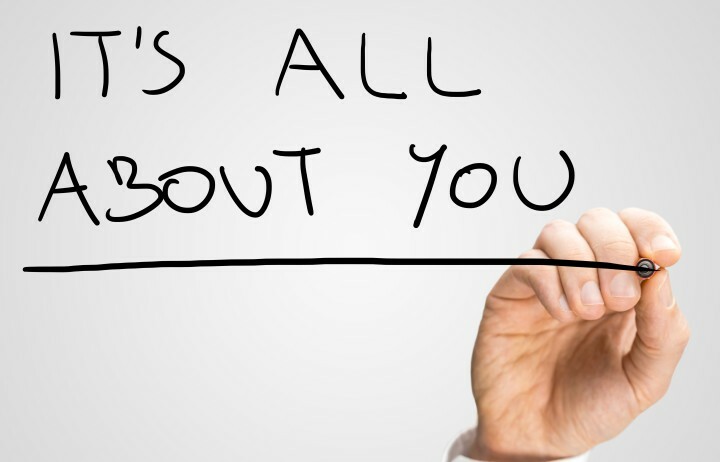 Inevitably the question follows: what did you do differently?! Ultimately, the answer lies in their mastery of the elements outlined above – they sit in a balanced and elastic way, and are quiet until they want to be heard. You can become that magic rider, but it takes work. You have to take time away from trying to do the ‘fun stuff’ and make things all about you for a while. It’s the least you can do for your horse! Note: the sketches above are tracings of actual riders and horses. I now have a fun toy – an active pen for my touchscreen – and these are my first attempts. A bit rough, but a nice tool I hope to make more use of in future posts. 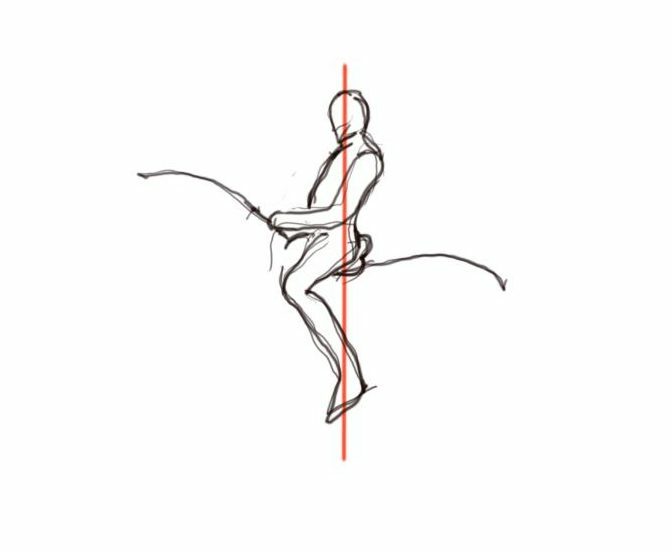 This entry was posted in Classical Training and Philosophy, Horsemanship and tagged equitation, horse and rider communication, rider balance, riding position. Bookmark the permalink.